Iron and manganese are commonly found in waters. They can cause unsightly staining and they can cause health problems. Catalytic oxidation is a tried and tested method of both oxidising the iron and manganese to form a precipitate and then holding on to it until it is automatically backwashed to drain. This method is good for iron if the pH is over 7 and manganese if the pH is over 8.5. Often this is not the case and iox exchange method comes into its own. Crystal Right ™ removes iron, manganese and hardness (and reduces ammonia). The minimum pH requirement is 6.0 and Crystal Right ™ balances the pH in these acidic waters. Crystal Right ™ works at it’s best on clear water, i.e. when the iron/manganese are in a dissolved form. Crystal Right ™ will also reduce hardness with no extra treatment. The media bed can be sanitised with chlorine from time to time (some valves can do this automatically). The regeneration process is exactly the same as that used in a water softener and requires regeneration with salt (sodium chloride). There are two types of Crystal Right ™, CR100 is used where the pH is between 6 and 7 and CR200 is used where the pH is 7 or above. 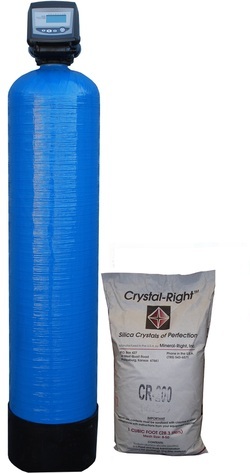 Crystal Right has a number of advantages over conventional systems in that pH correction, iron/manganese removal, ammonia reduction and softening can all be addressed in a single process. It can reduce dissolved iron and manganese even at pH 6 (most other medias can not). Aquamandix is a robust natural mineral conforming to British Standard BS EN 13752. It requires a pH of 7 or more for iron removal and 8 for manganese removal. Aquamandix is a cost effective filter media which can be mixed with sand where the Aquamandix catalyses the metals and then the less expensive sand filters out the precipitate. It can also be mixed with pH media to and increase the pH all in one system. Filox can be used for iron, manganese and hydrogen sulphide removal by catalytic oxidation. It is a robust media allowing a faster service flow rate than other iron removal media. A pH of 7 is recommended for iron removal and 8 for manganese removal. It is a heavy media requiring a strong backwash. Adding other media is possible but can impair it’s service flow rate. Birm is a relatively inexpensive material which can be used for iron and manganese removal by catalytic oxidation. It requires a pH of 7 or more for iron removal and pH 8 for manganese removal. It is advised not to use Birm in combination with chlorination and the water should be free of oil and hydrogen sulphide. If the pH of the water is too low pH correction maybe required. Birm is a light, inexpensive media but often doesn’t last quite as long as other natural media. These media will remove iron, manganese and hydrogen sulphide which are all oxidised by the media. This oxidation capacity becomes exhausted and is periodically regenerated by potassium permanganate or chlorine. They operate over a wide pH range (6.2 to 8.8), sometimes without requiring pH correction.